I love a shop that is full of patrons gossiping and discussing politics from back home, which I have no way of verifying, but am 100% sure was happening with multiple groups of men when we walked into this tiny restaurant in Norwood. This newcomer seems to be an instant hub for the Bangladeshi community in the area. The sign in Bengali on the shop's window translates to something like "from one's own country," and is also the name of the restaurant. The space was obviously used for a Chinese takeout before, as south Asian dishes are now backlit above the counter rather than photos of General Tso's chicken and beef with broccoli. A giant photograph of a popular marina restaurant in Hong Kong still is the restaurant's only decoration. 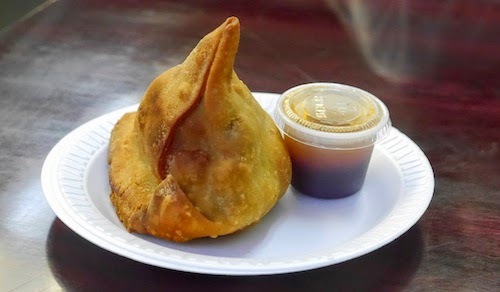 The vegetable samosas ($1 each, below) here don't appear to be much more than any other joint, but we looked at each other in surprise after our first bite of the delicious, if reheated, appetizer. Some serious effort has gone into refining the spices used inside of this pastry. 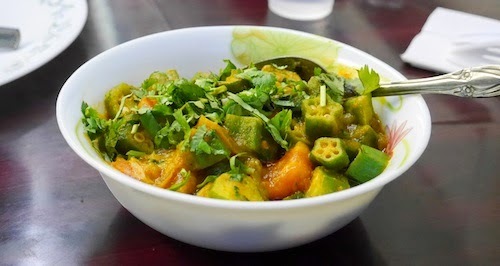 Without much room in our stomachs, we opted for a light vegetable dish in the bhendi masala ($9, below). It comes with a healthy serving of rice, and while served more in the north of India, we did not feel too bad about asking for it since the dish can be found throughout Bengali regions and Bangladesh as well. 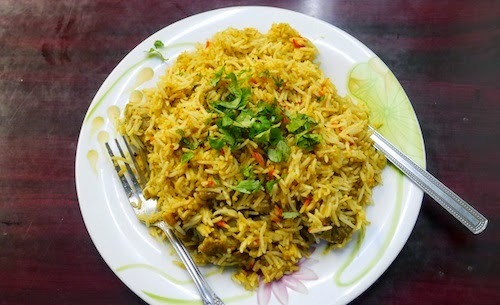 After some great experiences eating biryani in Bangladesh, I usually cannot refuse to make this dish part of my meal at any Bangladeshi restaurant back home. I wanted to show my knowledge and talked about the famous shop in Dhaka called Haji Biryani, a local institution serving only one dish: mutton biryani, cooked all day in earthenware pots. People would start lining up at the shop before the 4pm opening. I walked away from this place with the kind of smile you get only from a dish worthy of pilgrimage. Apparently the shop owner here disagrees with me, as he waved his hand without the slightest interest in my trip to Dhaka and said they cooked it here in the style of what sounded like "Tommy." I have looked this and other spellings up without success. While I am not a convert from the lamb biryani ($10, below) here, I would like to find this version on the streets of Dhaka for comparison. I doubt they have large earthenware pots in the back kitchen, but this dish does seem to be cooked for a good amount of time and the meat is really good. 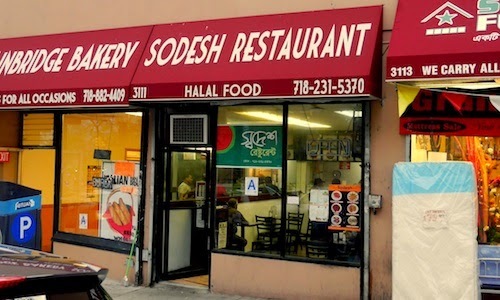 My only complaint about Sodesh is probably something they cannot avoid, and that is gearing their menu to a more user-friendly pan-south Asian array of dishes that anyone in the area will feel comfortable ordering. You can find chicken tikka and saag paneer. Unfortunately none of the tables here when we arrived were eating, so I could not gather suggestions easily from their choices. Next time I might have a longer conversation with the shop owner or some of the patrons to ascertain the reason they are meeting here.